It involves a brutal travel schedule. Clients expect you to have all the answers. You’d be right about only one. 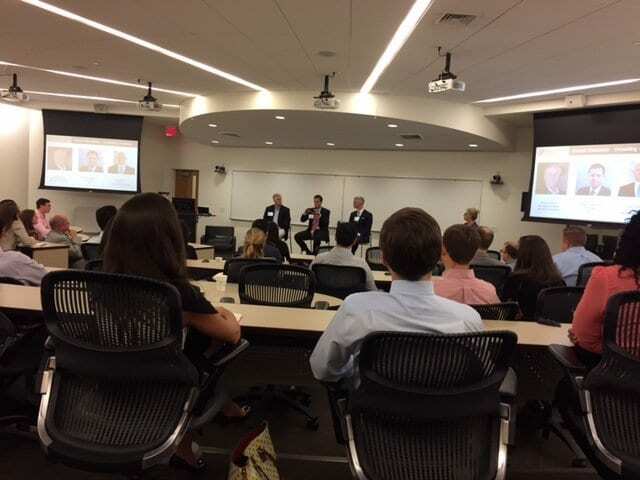 That was the consensus of Bradd Craver (BS ’83), managing director at Deloitte Consulting; Barr Blanton (BS ‘06), partner at McKinsey & Company; and Drew Cawthorne (BA ‘05, MBA ‘11), principal at Ernst & Young. All three are part of the vibrant alumni network helping MBA students prepare for what’s next. And all were part of the Deacon Discussion Series on consulting at the WFU Charlotte Center where the School of Business offers MBA education on evenings and weekends. The topic – and the panel of professionals – yielded a full house of around 50 students, alumni and other businesspeople on April 13. The first question the three Charlotte-based consultants were asked: What skills does someone need to be impactful in your business? These aren’t order takers or yes men. Clients hire Deloitte, EY, and McKinsey because they want innovative thinking – and to push the envelope. All three agree you’ve got to enjoy solving big, complex problems to enjoy being a consultant. You’ve got to want to have an impact – on your clients’ business and in your community. The three took different paths to get where they are. Blanton and Cawthorne have MBAs. Craver doesn’t – but he joked that his MBA equivalent came from working with Teamsters when he was in the manufacturing business. He had deep industry experience in both healthcare and manufacturing, and Deloitte wanted to tap into his knowledge. But he had something even more important than industry experience: a sense of honor. “I learned integrity first,” he said. “Your customer needs to be more important than you.” The consulting/client relationship must be based on trust. Like Craver, Blanton logged work experience before becoming a consultant. He even ran his own business in Atlanta for a year before deciding the place he could learn the most was McKinsey. “There was a steep learning curve, but that’s what I wanted,” he said. Cawthorne’s path to consulting was unusual: He was hired straight from MBA school. He loves the EY culture and already happily considers himself a “lifer” at the firm. All three consultants appreciate the collaborative nature of what they do. It can seem like perpetual travel, too … although Craver said many in the industry are working to change that. Cawthorne said it’s actually a positive not to have all the answers: “Showing some vulnerability helps build client trust,” he said. “You show your integrity by not being a know-it-all.” He relies on the expertise of colleagues when he needs to. And clients appreciate having access to a variety of (expert) opinions. Many roads can lead to becoming a consultant. But an ability to solve big problems and a love of collaboration are key to success in the field. And a willingness to travel is still a plus.